So – there is an almost complete List Of Zombie Movies on Wikipedia that shows us a number of good films with zombie themes – that should be watched. And I started with the first on the list – White Zombie. I do not recall seeing the movie before – but since I watched lots of movies – I might not remember correctly – but anyways – I am watching the movie and I will present aspects of the story / characters / villains – how zombies are portrayed here. The movie was directed by Victor Halperin, written by Garnett Weston and it stars among others – Bela Lugosi, Madge Bellamy, Joseph Cawthorn and Rober Frazer. It was released in august 1932. The review will contain spoilers to a certain point. I will not describe the movie but some scenes that are essential for the development of the story. A notable thing about the movie is the simplicity of it – that makes old movies special – no tons of special effects to take you into surreal planes – just simple montage – with basic editing techniques that describe the actions and situations. The first scene in which we see the zombies – it is a quiet and simple scene – the creepiness of it is stated by the fact that these creatures stay fixed and focused without making any sounds – they look as a whisper from beyond the grave is making them move towards certain destinations. This is the story of a couple invited over to Monsieur Charles Beaumont – whose real plan is to seduce and flee with the girl. For this – he ends up to some local’s farm – who uses his powers to create a mass of mindless zombies who work for him. He promises Beaumont a potion that will make the girl all his. He is taken to the farm by one the the zombies. We assist to a scene in which basic movement is involved. The zombies are depicted as being harmful and slow – the standard way that they were shown in the earliest zombie productions. As a result of an ritual – the girl will vanish from existence. The ones she leaves behind will be filled with regret and illusion. Her fiancee for example will see her image in shadows upon walls and watery surfaces. Some scenes are very well depicted in a dark Victorian atmosphere – all the mystery and the action make the plot whole. The curse of the undead takes its toll – and a turn of events will lead to an unexpected development of the plot. So… next article will feature a full Left 4 Dead campaign that I played recently.. and tomorrow I want to listen some zombie podcasts and write about them. Today I worked like 7 hours on my project and didn’t get much time to enjoy other zombie media. But probably tomorrow I will. This entry was posted in Blog, Zombie and tagged 1932 movies, bela lugosi, Dracula, horror movies, left 4 dead, old movies, white zombie, zombie, zombie podcast on February 18, 2018 by Gratian. 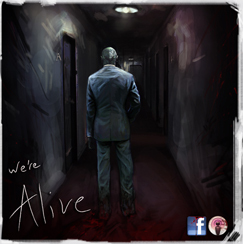 Recently I sat for hours and listened to this amazing audio drama called We’re Alive. It’s about the zombie apocalypse, it’s free and it’s the greatest thing I’ve heard in my life. It’s not your everyday undead tale, but a collection of drama, horror, crime, comedy and action elements. You can find it here – The Zombie Podcast. From the first episode we deal with intensive drama and factual depictions through the eyes of the characters. Sergeant Michael Cross is the one who involves us in the story. By his monologue he describes his life at the moment of the outbreak. Later, he and his military intelligence comrades start the battle against the zombies. While the episodes keep running, our heroes encounter many obstacles, rescue other survivors, deal with the hungry hordes and try to live as normal as possible. They always have to explore the remains of the city to find out resources like food, drugs and munition. The show has a great action-adventure atmosphere. When the survivors don’t fight with the undead, they must fight for their belongings because other “survivors” want to conquer their territory. There are 18 episodes structured into 2 seasons [til this moment]. Every episode has three parts. From the beginning it gets you addictive and with every episode, the story is developing – becoming more intense and more interesting. The ending of each episode leaves a wide space for interpretations and a sense of wanting to know more. You can find additional details at the Zombie Podcast Wiki. This entry was posted in Podcast, Zombie on February 14, 2011 by Gratian.